Konversation is a user-friendly Internet Relay Chat (IRC) client. 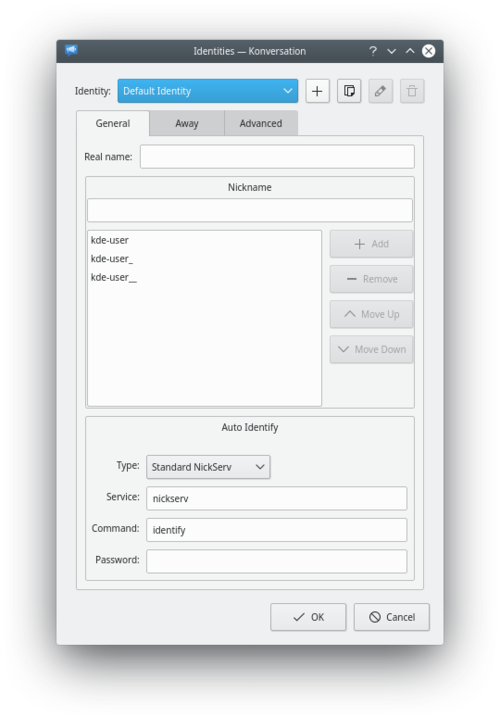 If you are new to IRC (Internet Relay Chat), you need an application that's easy to set up. If you have used IRC before, you may well need power features. Konversation is the perfect answer to both these problems. 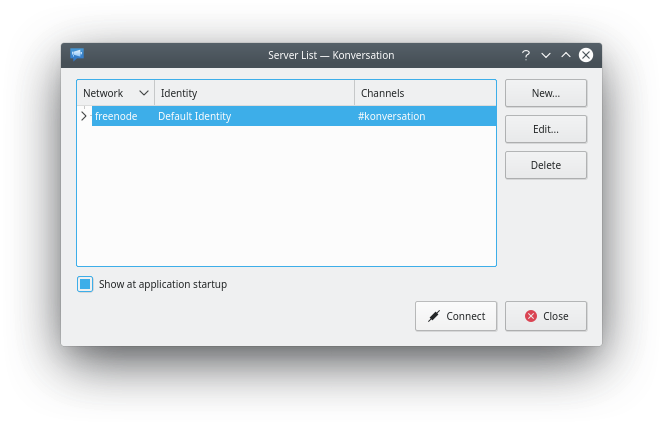 Start Konversation from your menu and you are immediately presented with the Server List screen. Consequently you can ignore the buttons for adding or editing channels. Click Connect and you will see your connection being set up. The first time you use Konversation you will be invited to edit your identity. A list of useful channels is on the IRC channel page. That's everything that's necessary. There are, however, a few things that are a real convenience, so worth considering now. Query - someone wants a private conversation with you. Private Message - you have received a private message. Nickname written - if your name is being used in a conversation you probably need to be part of the conversation. That's it! Join a few channels and get to know people. When you want to get to know Konversation better, Help -> Konversation Handbook will introduce you to the many other features. 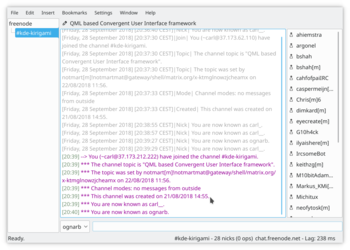 Tight integration with KDE, including support for connecting users in chat rooms to KDE Addressbook entries, makes for the best possible IRC experience for KDE workspace users. Collaborative drawing (think "multiplayer KolourPaint"). Auto-replace in incoming and outgoing messages. Various bundled scripts, e.g. a "now playing" one. This page was last modified on 31 December 2018, at 20:01. Content is available under Creative Commons License SA 4.0 unless otherwise noted.